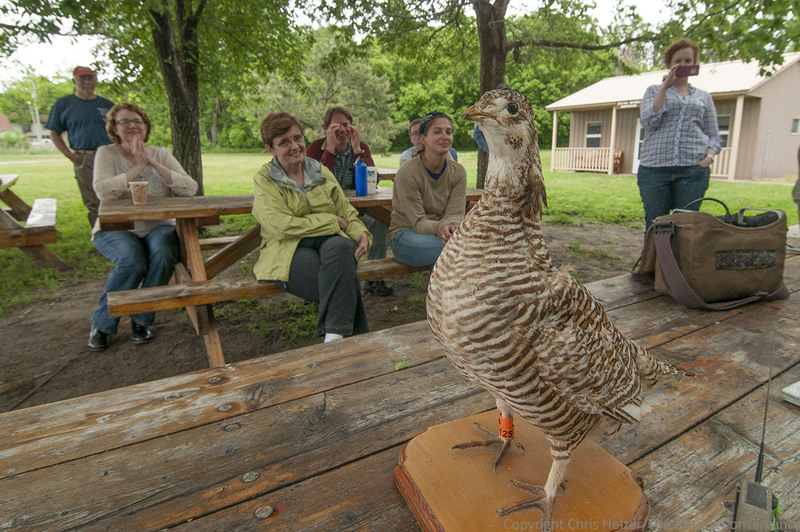 Last weekend, I helped with an event up at our Niobrara Valley Preserve. 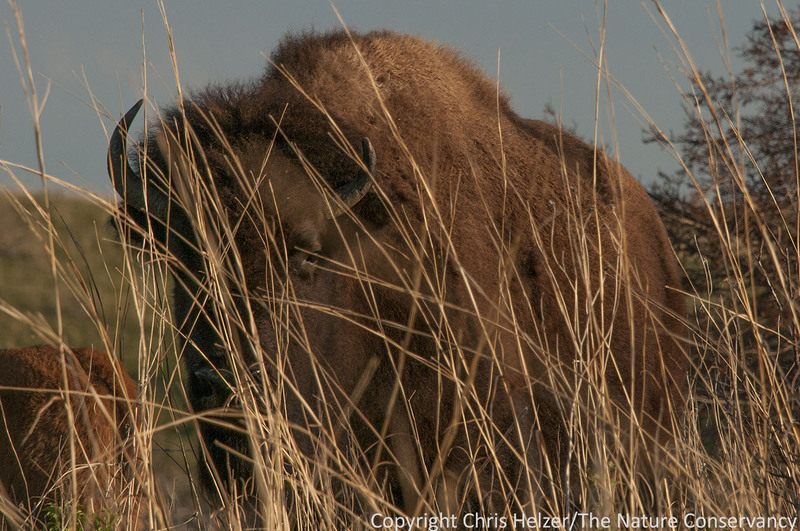 Neighbors and members of The Nature Conservancy were invited to visit the Preserve, enjoy some home-grown bison burgers, and tour some of the 56,000 acre property. I got to take my two sons up with me, which made the trip even better. 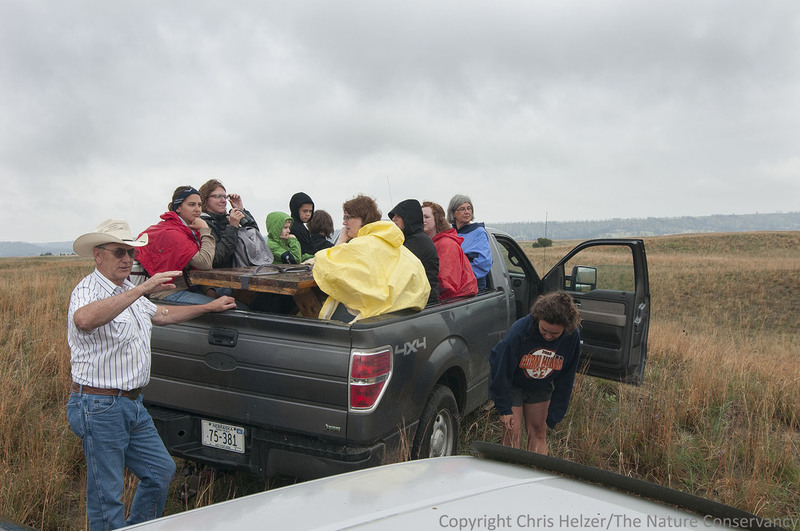 Richard Egelhoff led a tour of the east bison pasture (10,000 acres). A little light rain didn’t stop us from having a great bounce through the sandhills, and we found the first group of bison about 5 minutes in. 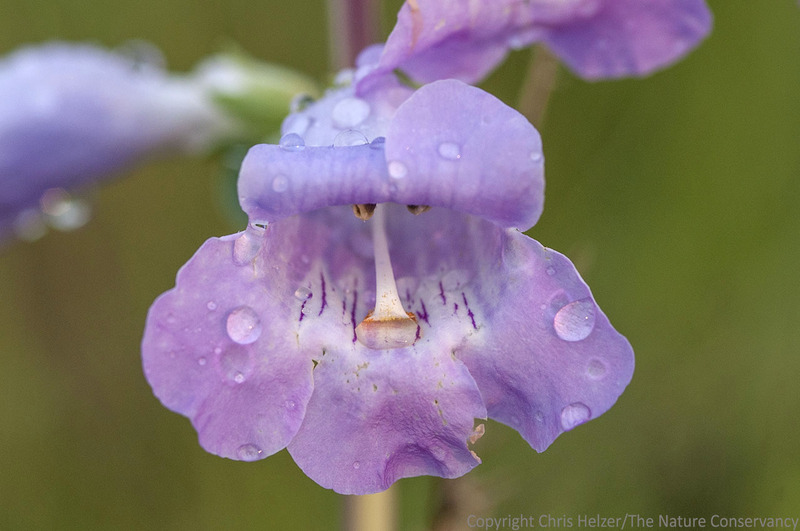 It was overcast and sprinkling off and on through much of the weekend, but the sun popped out just long enough on Saturday morning for me to capture the light hitting this shell-leaf penstemon flower. 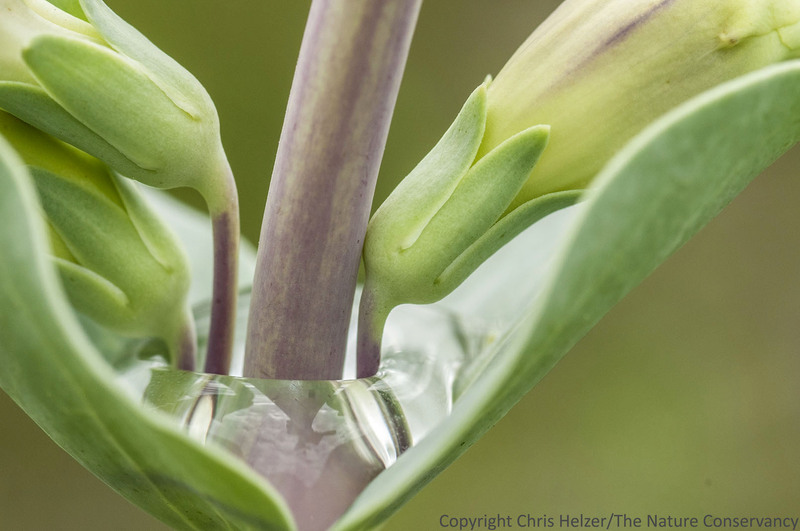 Rainwater gathered in the leaves of the shell-leaf penstemon – adding a little extra beauty to these gorgeous plants. 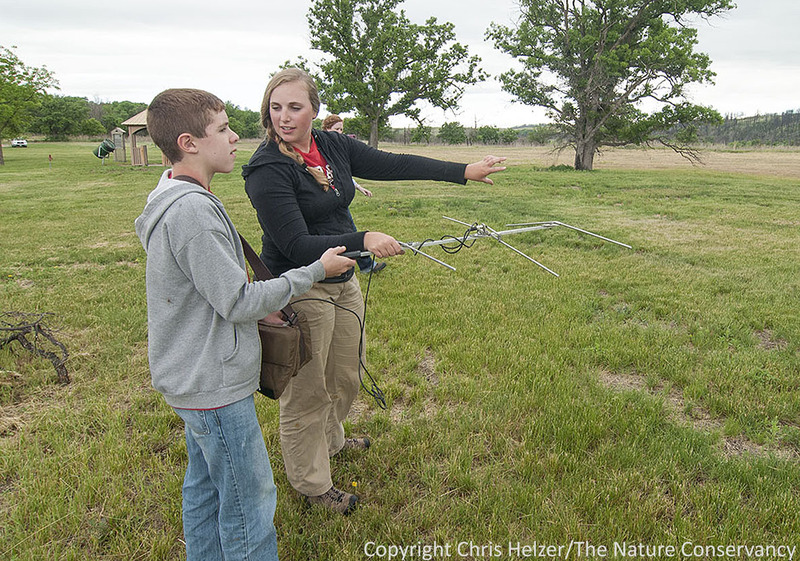 Jocelyn Olney, a graduate student at UNL came and talked to the group about her work tracking greater prairie chickens in the sandhills. She brought a display bird to show how radio transmitters are attached. It was pretty popular with the crowd. Jocelyn also demonstrated how to find the tags, and my sons both got a chance to try it out. Here, Jocelyn instructs John on the technique. 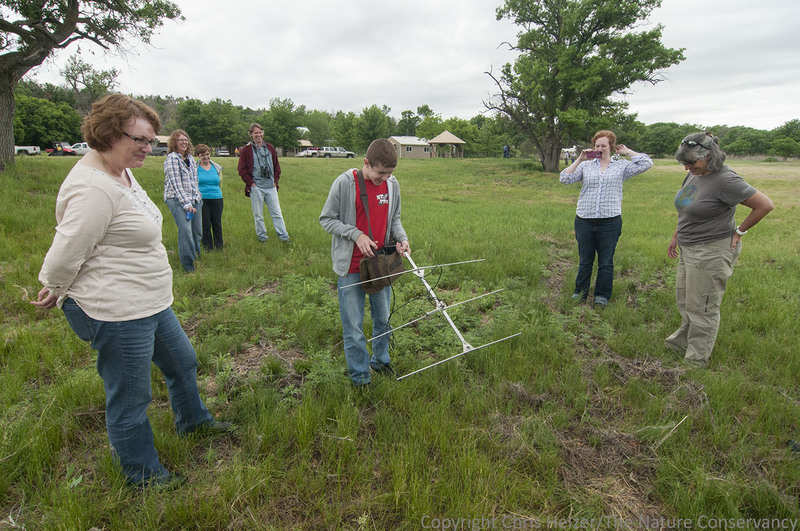 As he honed in on the transmitter hidden in the grass, John attracted a crowd of supporters. Richard got a chance to try it out too. If you know Richard, you can guess how entertaining that process was. After lunch, I led a hike up in to the hills. We found all kinds of things to look at, including kangaroo rat burrows, spittle bugs, wildflowers, grasshoppers and katydids, wolf spiders, scenic views, and much more. After the event ended, my boys and I stuck around for another day to explore. We went over to the north side of the river to see how the woodland areas there were recovering from the 2012 drought and wildfires. 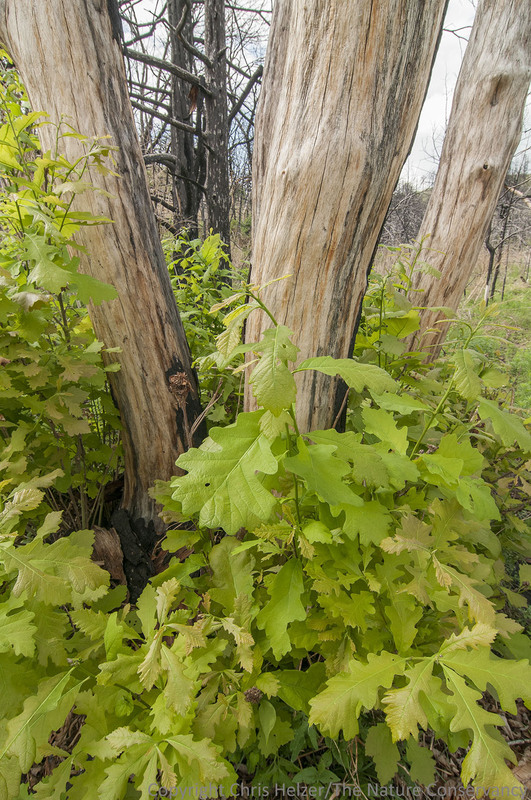 Most of the ponderosa pine are (still) dead, but the majority of bur oaks are resprouting vigorously from their bases. The sun finally popped out Saturday night and the boys and I got to drive up pretty close to a group of bison, but not quite close enough for unobstructed photos. On the other hand, we had better looks at bison than the porcupine we chased through a sumac patch (we were in a vehicle). Sunday morning started with a beautiful infusion of sunshine and scattered clouds. Spiderwort, puccoon, and western wallflower decorated the sandhills nicely. 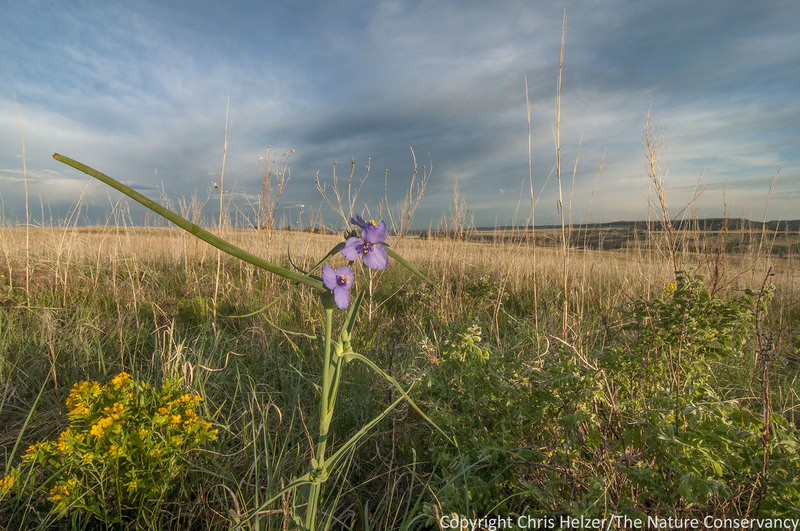 The color of wildflowers and vibrant green vegetation were beautiful reminders of the resilience and recovery of the prairie from the severe drought and wildfire in the summer of 2012. 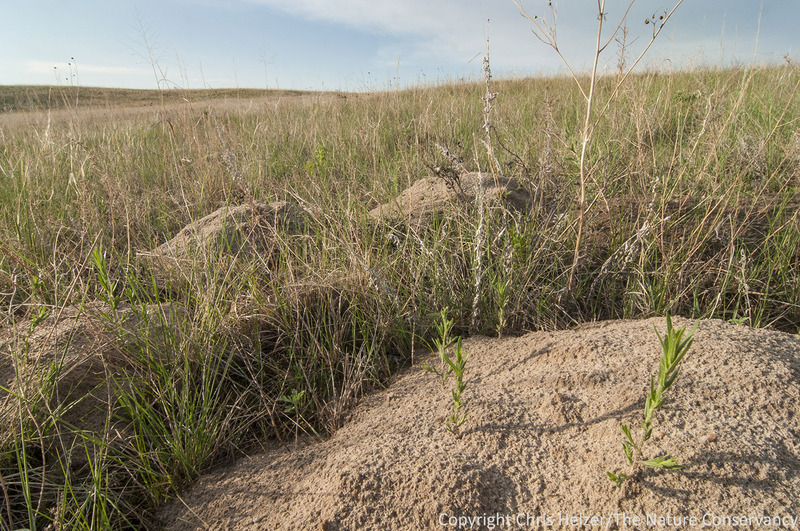 Pocket gophers play a huge role in the ecology of the prairies at the Niobrara Valley Preserve. 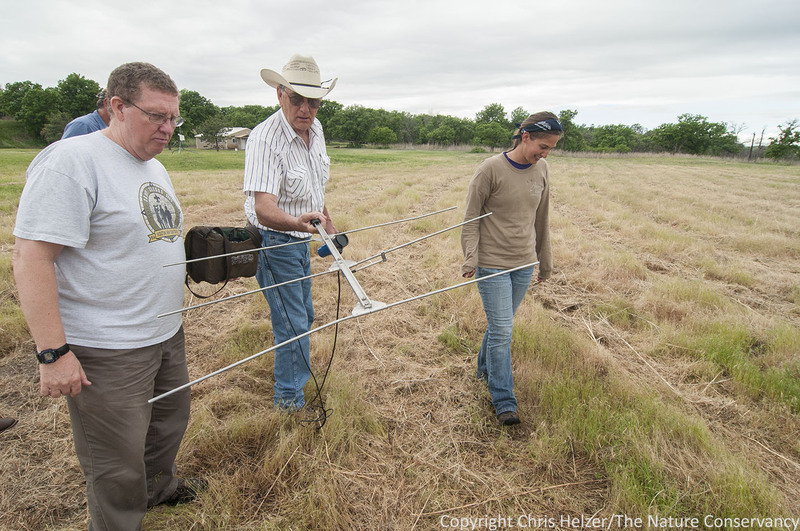 Researchers have found that nearly 1/5 of the prairies are turned impacted by gopher mounds in some years. 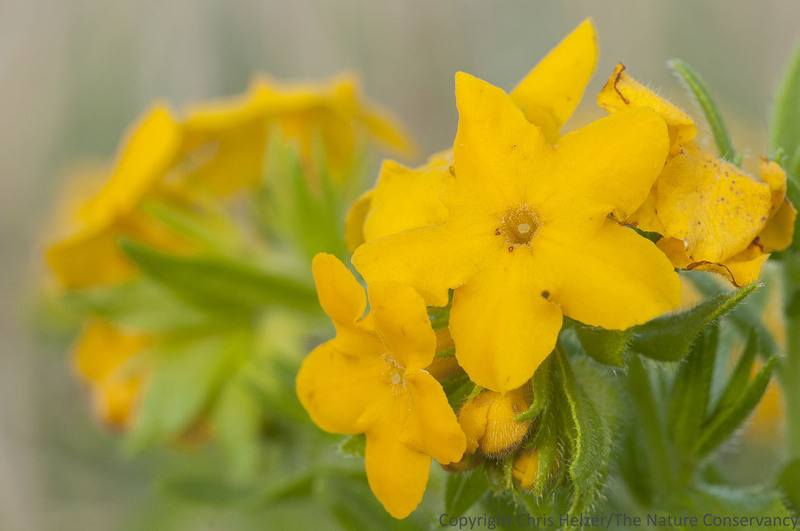 Hairy puccoon (Lithospermum carolinense) was resplendent in the morning light. 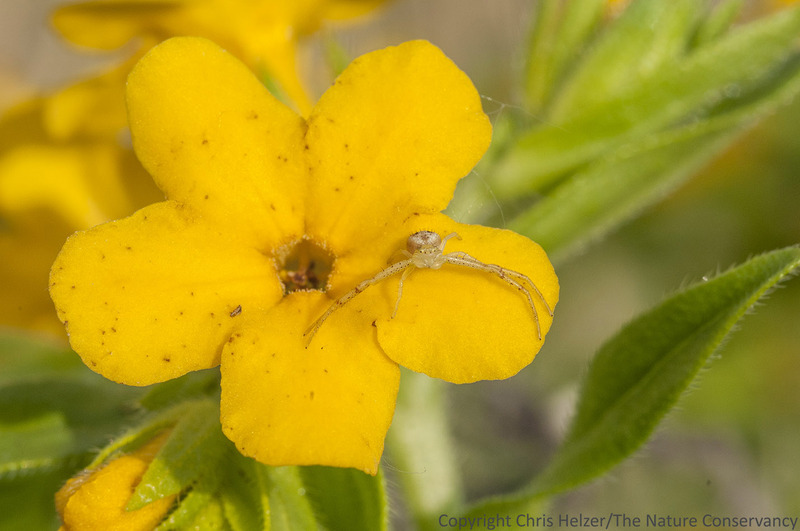 Crab spiders (of course) were waiting for unwary pollinators of the puccoon flowers. This goldsmith beetle had been hanging around the visitor’s center lights the night before, so I caught it and put it in a container so the boys could see it when they got up in the morning. Just before we left the Preserve, we released it – and it graciously hung around for a few photos. We left just before the rain started up again at the Preserve, and got home and into the house just in time to watch a nice soaking rain through the windows there. 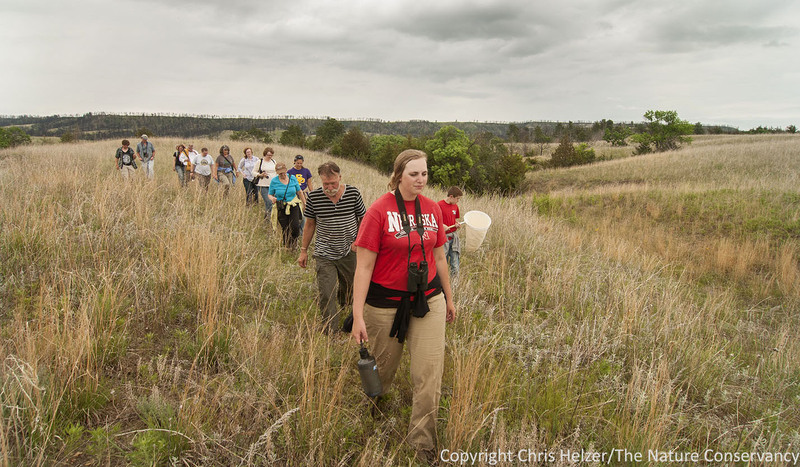 Thanks to all the staff up at the Niobrara Valley Preserve and everyone else who organized the event. 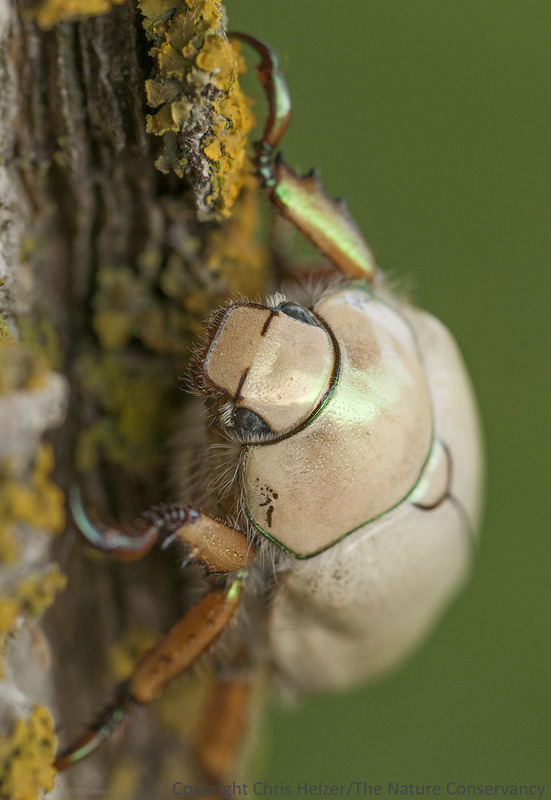 This entry was posted in Prairie Animals, Prairie Insects, Prairie Natural History, Prairie Photography and tagged event, field trip, may 2014, nebraska, niobrara river, niobrara valley preserve, photo, photography, the nature conservancy by Chris Helzer. Bookmark the permalink. It was great having you as part of the weekend. I always learn something when Chris Helzer is around. Sunday morning’s dark, ominous sky was awesome with the sun coming up in the east. Nice backdrop to some of your pictures. Thank you for posting the pics. Especially the blooms and buggies. Loved the spider adornment on the yellow flower; gave it just the right touch! 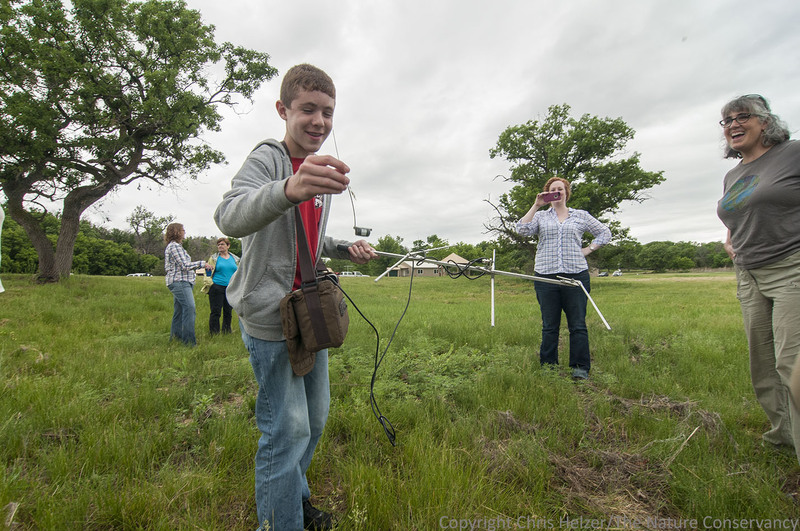 Thank you for capturing the event so well, Chris! Nice photos! Thank you for helping out and documenting the weekend for us!